In a recent landmark exhibition on the intersection of art and dance, Danser sa vie, the Centre Georges Pompidou displayed an enigmatic photograph identified as the artist Sophie Taeuber dancing at the Cabaret Voltaire in 1916. It is not uncommon for a photograph to stand in as an icon of a live event and offer what we hope is access to some present now passed, but for decades scholars have disagreed on the date and location of the Taeuber photograph. To see it staged with the aura of the museum, as if it were an indexical relic of the famous cabaret, was troubling. It is, in fact, the image’s unfixable status that is important. As an anonymous portrait of an Expressionist-trained dancer and female Dadaist, Taeuber’s image instead ought to provoke questions about other examples of Dada interest in unsigned, heterogenous, and hybrid action. Carefully posed but masked and abstract, the image is both for and against a representation of the body. Depicting a dancer in position, burdened by an excess of material, it is for and against the possibility of movement. A still photo and a suggested performance, it is both for and against presence.1 The photograph demands an investigation of dance as a medium of Dada, one that I will argue is not merely an extension of Dada’s cabaret performance and bodily humor, but a form of knowledge that is both for and against the codes of language in that it privileges the living body. Amid the fractured and dehumanized environment of wartime Europe, Taeuber’s danced Dada art creates a radical-aesthetic hybrid wherein the reified traumatic body is merged with abstract form. Taeuber was among the earliest participants when Dada was launched during World War I on neutral ground in Zurich. Better-known for her small-scale works of textile, sculpture, and design, Taeuber’s Laban-trained knowledge of dance also played a role in each of the now-mythic venues that helped set the stage for Dada as the first of the so-called revolutionary historical avant-gardes. The photograph, our only visual evidence of Taeuber’s activity as a dancer, shows the artist in a Cubo-Dadaist costume often attributed to her partner, Hans Arp. (I address issues of the photo’s various attributions below). In the black-and-white image, we see a figure posed against a dark and unidentifiable background. The body wears a collage-covered gown and rectangular mask. A tuft of dark, bobbed hair peeks out to the right and, on closer inspection, to the left of the figure’s neck, and offers the only clue that the figure might be a woman. Long rigid tubes cover her arms from shoulder to fingertips and end in jaggedly cut paper, as if in parody of exploding French 75 cannon shells.2 The mask carries a similarly jagged and shiny crown. Its two mismatched eyes stare vacantly, one seemingly outward, the other taking a less focused inward glance. A large protruding paper nose sits above a huge mouth, gaping with teeth and perhaps an extended black tongue. The expressive parts of the dancer’s body, the head and hands, are encased in sculptures of rigid geometry while her core and viscera are more softly swaddled under a multiplicity of variously shaded fabrics and paper. Atop this body covering, the forms are more rounded and flexible, and a second potential mask stretches across the dancer’s midriff, where once again a mouth of jagged teeth seems to hang open. The figure’s lower legs are in darkness and black fabric covers her shoulders, so that the parts of the body seem to float separately, disjointed and strung in space like a marionette awaiting impulsion. 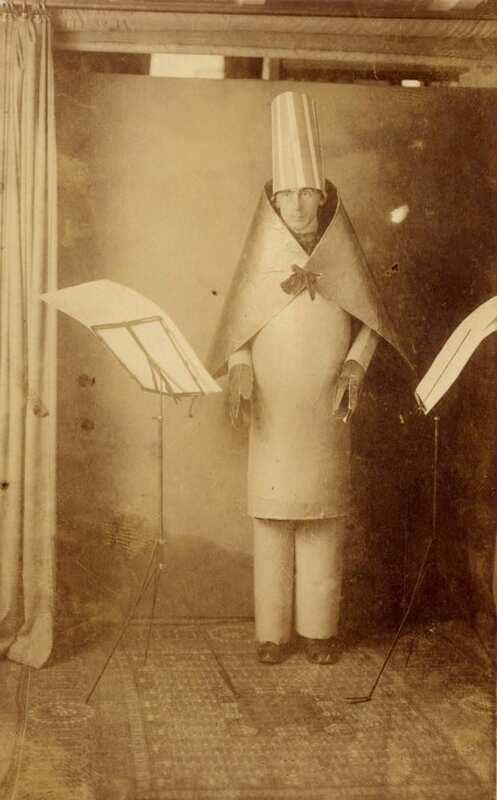 Judging the photo against contemporaneous Dada collages and costuming, it would seem reasonable to suggest that the costume’s forms were richly colored in an abrupt mix of matte and metallic materials of blue, white, and brown, perhaps also scarlet, silver, and gold. Unques­tionably an exciting and provocative image, the photograph has allowed art his­torians to illustrate the movement’s interest in primitivist forms and to showcase the wide range of Dada’s materials—that is, through disembodied references to the mask and wearable collage made by Taeuber’s colleagues. The photograph merits deeper consideration as an image of Taeuber’s artistic oeuvre and, even more critically, as an image of dance. Surely Taeuber’s female body, falling to her left with disjointed articulation and gesturing arms, was not merely a mannequin for her costume but rather, as I will argue, an intentional bodily intervention within Dada Zurich’s political and aesthetic realms. Since a darkened theater all but prohibited photographing live performance until mid-century, the above uncertainties should accompany any purported photograph of avant-garde performance. Even the famous photograph of Ball reciting poetry at the Cabaret Voltaire is more arguably an image staged before or following the actual event. When accompanied by Ball’s account of his performance as the Magical Bishop, in which he corroborates many of the photo’s details, it is tempting to believe we are looking at a live moment during performance. In truth, the photo can assure us only a view of the costume and bodily presence arranged by Ball and his photographer to represent the event. Ball wrote that his costume involved a single, cylindrical obelisk that covered his legs up to the hip, but here we see Ball’s hips are instead fully covered by a cylinder that wraps his torso, and each leg has a separate tubular covering.9 Other photographic details stray from the remembered event: Ball writes of three music stands that faced the audience, one at each side of the stage. In the photo, not only do the music stands face the performer, but we see only two, close together, with little indication of “sides.” The photograph reproduced here is a less-published print; its wider crop provides more sense of the scene to Ball’s left and above his head.10 The view includes the rod on which the “stage” curtain hangs, revealing it to be placed only inches above Ball’s hat, with the backdrop nearly abutting it. We also see light from a window and ceiling beams deep in space behind the flat backdrop. The spatial information visible in this print suggests that the photo is set up in a studio or apartment, with the backdrop hung in front of a wide door jamb; the rug on the floor now seems a part of home décor rather than the cabaret’s more spacious platform.11 This is not to say that the photo is inconsequential to understanding Ball’s performance; rather it shows the importance we place on an event’s live-ness. If the wider image has been treated interchangeably with its more-cropped version and the photo’s inconsistent details either unnoticed or unquestioned, it betrays our eagerness to suspend disbelief in order to imagine the possibility of being present at the Cabaret Voltaire performance. The Ball image ought to remind us of the problems of using a photograph to reconstruct an image of past performance, even when we have a detailed description and known performance with which to link it. It also shows us how unvigilant one’s eye becomes when a presumed documentary photograph is used as mere illustration. In the Taeuber case, an author’s unequivocal caption merely offers it for consumption by a parasitical text, whose argument is already written.12 The difference between venues was vast, and to accept the photo as a mere document of either the Cabaret Voltaire or the Galerie Dada mutes what the photo can tell us about the dancing body as a medium for Dada. As Zurich Dada’s early leader, Ball lent the cabaret a very different atmosphere of community in the face of horror, over and against the rebellious but ever-more staged events at the Galerie. At the Cabaret Voltaire’s core was the internationalism of its name and its participants. The majority of the movement’s members were escaping or protesting the war by living in Zurich. In fact, the back cover of the 1916 Cabaret Voltaire publication reads, “To avoid a nationalist interpretation, the editor of this volume declares that it has no relation with the ‘German mentality.’” This is followed by a list of participating artists from nine nations that concludes with the “homeless” Emmy Hennings.13 The venue’s French Enlightenment name in a German-speaking city was a metaphorical crossing of the war’s Western Front. The early days of Dada in Zurich contained seeds of hope through mystical and universalist—if at times also anarchist—community-building. In Ball’s words, “We want to do beautiful things. . . . The activity and interests of those involved in the cabaret clearly show that it is aimed at the few independent thinkers whose ideals extend beyond the war and their native lands.”14 In contrast to the prevailing characterization of Dada as cynical and annihilative, Ball’s 1916 cabaret sought a new society of individuals with internationalist politics and, potentially, a universal language. For poets of the movement, the urge for universalism drove the invention of famously absurd noise poems that stripped language of its divisive uses in the service of propaganda, political gain, and violence. It is important to point out how Taeuber’s dancing female body, neutered and anonymous under the clumsy costumes and mask, is in keeping with this form of resistance. She embodies the absurd, and thereby might more viscerally communicate the tragicomic sentiment particular to wartime Dada. Ball left Zurich not long after the Cabaret Voltaire closed, paving the way for the movement’s more antagonistic stance with Tzara as Zurich’s spokesman. Tzara’s own Dada manifesto denies the idea of community and calls for the total erasure of the institutions of culture: “A work of art is never beautiful by decree, objectively and for all. Criticism is therefore useless, it exists only subjectively, for each of us. . . . Thus DADA was born of a need for independence, of distrust toward the community.”15 Under Tzara’sleadership, Zurich Dada leased the art space that became Galerie Dada; new collaborators, some returning from the war’s frontlines, also influenced a shift toward action and exhibition. The Galerie showed work by such established artists as Vasily Kandinsky and Paul Klee from the Galerie Der Sturm in Berlin and put on afternoon teas and art history lectures. It therefore can be viewed as having worked to articulate a place in the art world, belying Dada’s endeavor to upset it. To claim one or another venue for the Taeuber photograph, then, makes a great difference. It changes how one might understand what motivated the design of the costume, and how a performer moved in it. For example, the Cabaret Voltaire location would privilege the possibility that her mask was made by Janco, which in turn would lead us to imagine Taeuber moving more spontaneously along with other masked Dadaists as is known to have occurred on at least one occasion.16 In support of this reading, I would note that in the photo Taeuber wears arm coverings identical to those of Ball’s Magical Bishop at the 1916 cabaret. Now an improvised masked dance at the cabaret would function quite differently from the more choreographed “abstract dance” with full “Cubist” costume by Arp that is described in the 1917 Galerie program and statements by Ball and Hans Richter. I would insist that despite the number of Dada studies and exhibitions that include the dance picture, the significance of her dancing body has been diminished by its use as mere illustration. As an account of Zurich Dada’s fascination with themes of the tragic mime, mimetic transference, and masochist expression, Hal Foster’s “Dada Mime” essay has certainly inflected my thinking on Taeuber. In Foster’s text, however, Janco and Ball are the protagonists, and Taeuber goes unmentioned. Instead, her photograph appears as a mute enhancement for the Janco mask beside it. Its caption—the 1916 cabaret in mask by Janco—does its work to bolster Foster’s argument, but leaves Taeuber a stand-in for any masked Dadaist. In Foster’s essay, all significance that the photo might derive from its capture of a woman artist and a trained dancer’s body remains unremarked, even imperceptible. The repeated silence on Taeuber’s image surely stems, in part, from the difficulty of discussing a kinetic art form from still-photo evidence; but it also signals a disciplinary blindness toward dance’s cultural and historical significance. Sally Banes and André Lepecki introduce their recent performance studies anthology with this very problem: “To carry out the task of analyzing ‘the senses in performance’ is also to carry out bio-political investigations of the many critical thresholds where the corporeal meets the social, the somatic meets the historical, the cultural meets the biologial, and imagination meets the flesh.”17 Thus appears the daunting task that may keep historians from “attending” to evidence of dance. I realize my discomfort with the thinness of material on Taeuber’s dance work may have been shared by previous authors.18 This act of settling for illustration over evidence is too often the fate of the fleeting presence of dance. 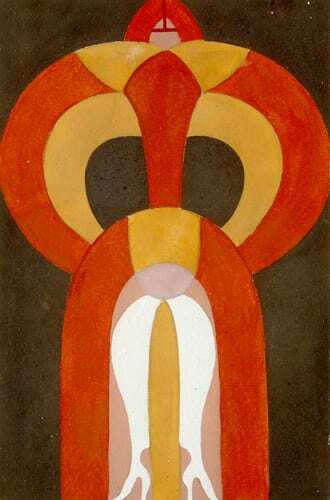 In the years leading up to Dada’s founding, Taeuber trained with Rudolf Laban in Ascona and Zurich. In his classes and through her friendship with one of modern dance’s founders, Mary Wigman, she would have learned to transform the previously decorative and narrative qualities of dance into radically spatialized form.19 Laban taught an idea of movement as a new kind of universal language and the common connector of every living thing. His concepts enlarged the realm of dance to include intuitive and abstract understandings of movement. For example, rather than teaching specific positions or combinations in dance, he described space as the “kinesphere” of the body, or a realm of potential movement, and individual actions were visualized through their geometric “trace-forms.”20 These abstract concepts are helpful in thinking about how Taeuber might have adapted his movement theory to her Dada costume as it enclosed and extended her body. The effect of her awkward collision with space would be based on a meticulously gauged environment in which the forms on and of her body make contact with the world through movement. Space would be conceived, as in Laban’s geometric principles, as a multiplanar icosahedron, and the dancer’s body the fourth-dimensional constituent that helps to articulate an understanding of the whole. Laban’s theories, and in particular his revolutionary dance notation system, also formulated dance as a new system of abstract, transmittable knowledge by visualizing the transitory form and kinesthetic sensations of movement in a geometric and conceptual language of an invented notation. Just as other artists of Dada attempted to neutralize received language through their poetry, the new dance would help Taeuber expunge the ideologies of power that monitor the human body.21 In a geometrically conceived Dada dance, we can imagine Taeuber’s masked body resisting the institutional, moral, and cultural controls of written and spoken language, gender, gesture, and pleasure, the very ideologies Dada implicated in leading a passive world into total war. By the time WWI erupted across Europe and its colonies in 1914, avant-garde painters in at least four countries had begun to produce works of complete abstraction. Others were carrying on Cubism’s still recent analytical experiments in form. Within weeks of France’s declaration of war on Germany, however, many of Europe’s most productive avant-garde artists were in uniform. Many artists left behind or returning from the front began to demonstrate marked, uncomfortable shifts in style during the war years and after.22 The increase in conservative technique and nostalgic subjects, particularly from France’s once radical and antagonistic avant-garde, is often placed within a larger culture of regionalism and a “Return to Order,” over and against the more revolutionary avant-gardes of Dada, Surrealism, and Constructivism.23 As I will argue however, Taeuber’s dance is in a position to bridge the polarized concerns about art making during wartime. With her body as medium, she merges the viscerally felt chaos of her time to the order of form. Taeuber’s artistic production during this period certainly defies boundaries. 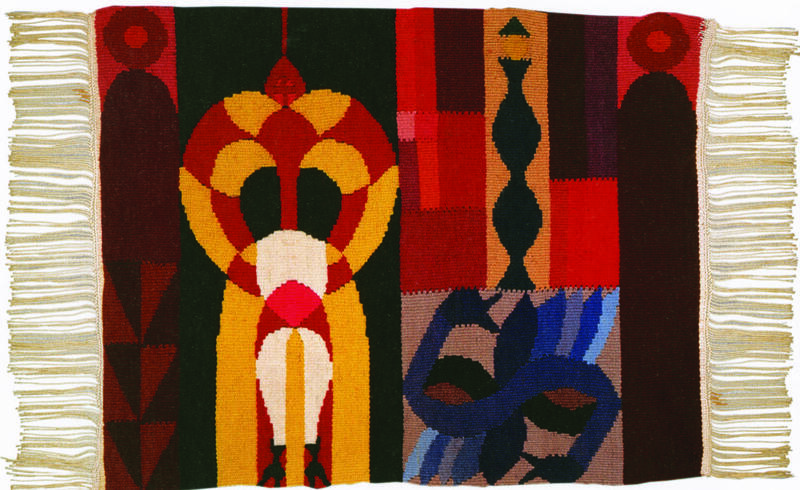 She was a woman artist in a major avant-garde, who refused to prioritize among her media—continuing to focus on her textiles, applied arts, and teaching while also making paintings and relief sculptures alongside her male colleagues. As a dancer, too, she shifted between the deeply emotive, Expressionist training with Laban and Wigman, and a Dada performance in which she clearly emphasizes anonymity and awkwardness. Ball recalled Taeuber dancing to his sound poems in 1917: “All around her is the radiance of the sun. . . . She is full of invention, caprice, fantasy. . . . It was a dance full of flashes and fishbones, of dazzling lights, a dance of penetrating intensity. The lines of her body break, every gesture decomposes into a hundred precise, angular, incisive movements. The buffoonery of perspective, lighting, and atmosphere is for her hypersensitive nervous system the pretext for drollery full of irony and wit. The figures of her dance are at once mysterious, grotesque, and ecstatic.”24 In Ball’s account, pleasurable, graspable forms meet with slippery, grotesque sensations, so that Taeuber seems to have created a dialectic between the body’s palpable form and presence and its dis­integration or absence. It is precisely through this hybridity of form and felt experience that Taeuber might express Dada’s hope for an art free of institutionalized meaning. With a Dada dance, the medium is crucially the human body, at once a behavioral agent for ideology and the site of individual resistance to coercion and assimilation. The body performs the boundaries of the known self—it separates the external, regulated, and public from the more free-form internal and biological. Through her costume, Taeuber grafted avant-garde forms onto an individual body and heightened their mobility, pervasiveness, and connectedness to life, but by dancing, she could publicly display abstract forms that had been incorporated into the very functioning of a private body. Even in the photograph we are aware of fine-art forms skirting Taeuber’s surface and then emerging from within her as action and gesture, showing how danced art can hold in tension an understanding of form as potentially coerced and bound (the costume physically constricts and hinders the dancer’s movements) and as an expression of individual life, experienced personally and internally (her tuft of hair, and the trailing line of leg under fabric). The danced art therefore sets up an anarchist claim to freedom within existing modes of art making. By inventing sound poems, Dada artists upset the given meaning of language. By performing, they further revealed language’s basis in mimicry.29 Ball asserted that the single isolated sound could be given “the fullness of an oath, glow of a star,” and might express “a hundred ideas at the same time without naming them.”30 Costumed by Arp and performed to Ball’s new language, Taeuber’s dance would have absorbed the external visual and aural forms of Cubism and Dada and performed them as a personal bodily function in a vitally unfixable medium. Dance’s calculated, abstract movements unhinge from normative bodily movement and awaken the sensation of new, unnamed muscular intentions. Soliciting a viewer’s kinesthetic empathy through performance, Taeuber’s danced Dada would draw attention to rote bodily existence and present the possibility of new responses, actions, and gestures that have been freed from fixed meaning. Through her collaborative process and the simultaneity of her other production in sculpture, sound, performance, textiles, puppetry, and painting, Taeuber seems to consistently resist habits of form. Yve-Alain Bois warns not to “equalize” or level the accomplishment in each of Taeuber’s various media since, in his eyes, there is importance and innovation in some areas and not in others; but there is something terribly important in Taeuber’s inclination to repeat a single design in textile, flat paint, and sculpture, and in her wish to also put her art into bodily motion.31 The forms in each of her mediums resist categorization by holding the very binaries of perception in unresolved tension: figure competes with ground, movement blurs shape, and self dissolves with other. She therefore appears to be thinking about translation, or better yet, transmutation between forms, which would make her aesthetic not formal and fixed but kinesthetic and intellectual. 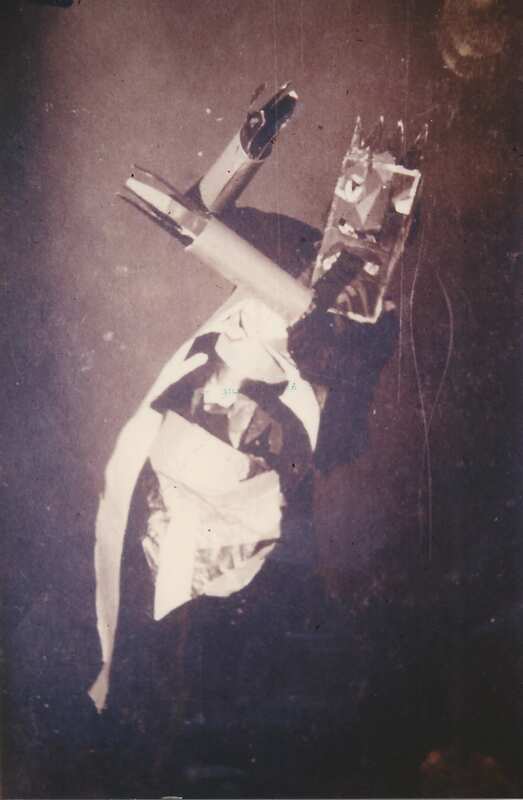 In Arp’s Dada collages, as Demos has shown, the pieces of paper dropped onto the surface retain their individual identities regardless of the pictorial whole; likewise, Taeuber’s repeated forms are designed to be unfixed, symbolic gestures, ever retaining the possibility of transference to another site. Like Foster’s presentation of Ball as Dada’s tragic mime, Taeuber’s formal adaptations in other media might be seen as morphing or adapting to her traumatic wartime environment. These along with Taeuber’s dance, and its adaptation to a photographic image, seem to demonstrate what Foster calls an “immunological” response to making art under stress: as Dada called art’s institutions into question, deemed them useless, the fit underwent mimetic adaptation to survive.32 We can see Taeuber’s art of survival in her adaptation of the dying or defunct plastic art amid total war to a living body through dance. That dance, still fragmented and mortal, then survives only through its further adaptation to the bodiless image of a photograph. Because Taeuber vacillated between her work in fine and applied arts, Bois is able to argue that she wasn’t after “majorness” or great-artist status. Her nondistinction, however, might also suggest she was not interested in the presumed apotheosis of pictorial formalism that her use of geometric abstraction implies. 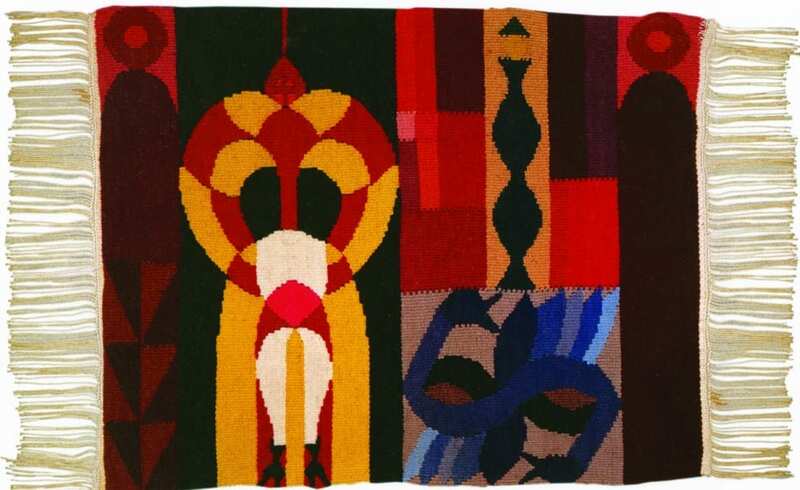 A number of scholars have made the point that as a textile artist and teacher, Taeuber was making abstract art avant-la-lettre.33 But as Bois explains it, while a decorative all-over pattern in textile is often dictated by the gridded medium, in the territory of early twentieth-century painting, abstraction was revolutionary, and this is the point Bois finds diminished by comparison among Taeuber’s media. Passing the same form from one to another medium, however, also makes the point that these forms are not just pictorial—they are adaptive, circulating forms that retain significance when expressed through other structures. Through her dance training, Taeuber was aware that movement produces new awareness and an engagement of the self in the world. Laban’s dance theory connected the kinesthetic experience of an individual to the geometry of space and the vital energy of the cosmos. It also could be visualized in transmittable formal symbols through Labanotation. Laban’s written dance was developed at his movement colony at Monte Verita with the assistance of Wigman, who explained, “Every movement had to be done over and over again until it was controlled and could be analyzed, transposed, and transformed into an adequate symbol.”34 Taeuber’s transposition of repeated forms across media—as in the form of the dancer in the photograph and in drawings and weavings from the following years—seems to make a similar study in reverse in which her symbolic plastic art is transmitted through diverse formal gestures.35 Foster’s essay reveals how mimetic transference allows the Dadaist to parody the symbolic order of his time and reveal its corruption and failures. Ball’s Magical Bishop, however, channels the metaphysical by miming a rigid body, paralyzed by trauma. His wartime subject survives his time only through near “self-disintegration.”36 Taeuber’s “hundred-jointed” dancer, on the other hand, throws a multitude of new gestures into the here and now of her space, engaging the potential of her own subjectivity and the kinesthtetic empathy of her spectators. 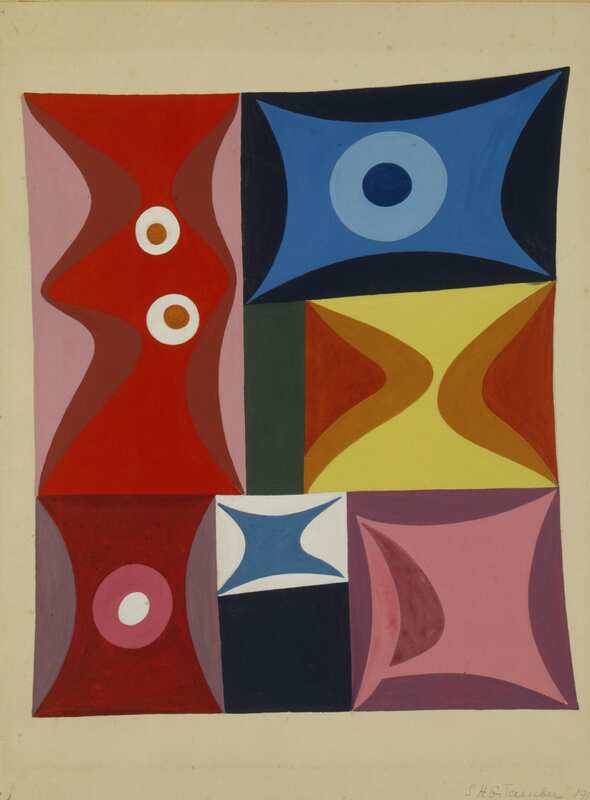 In its Danser sa vie exhibition, the Centre Pompidou highlighted a number of Taeuber’s painted studies under the theme of “the abstraction of bodily movement.” Across Taeuber’s plastic oeuvre, it is difficult to avoid reference to dance; her work in every medium calls attention to the dynamics of space, rhythm, and balance. But the connection is more than a literal illustration of one medium by another. Taeuber’s abstractions are not simply geometric schemas of movement mapped on an image from nature. 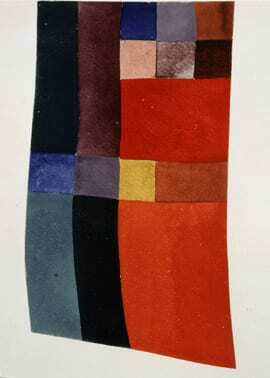 In 1943, Max Bill wrote of his friend, “Sophie Taeuber-Arp never knew ‘abstraction.’ She didn’t use excerpts from nature reduced to their most simple expression.” Rather, Bill explained Taeuber’s process as more creative, beginning from elementary, autonomous forms.37 In other words, we shouldn’t stop at an understanding of her rhythmic abstractions as representations of movement, even less as images of bodies shown displaced in space over time. We should look instead to how her abstractions provoke the visual and kinesthetic sensations of motion. 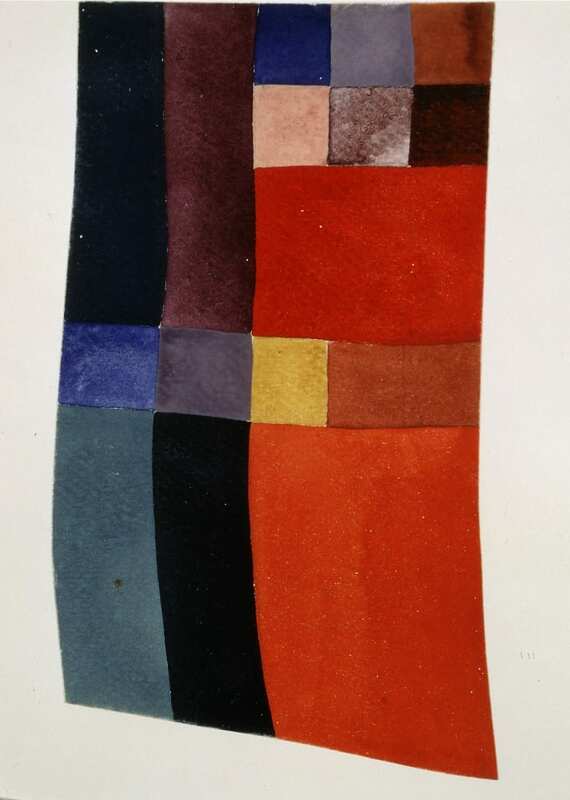 In design work from Taeuber’s Dada period, such as the 1917 series Elementary Forms in a Vertical-Horizontal Composition, the artist tests the stasis of the abstract modular grid by working first in free-hand sketches and watercolor that will later be adapted to the loom.38 As if imagining the body’s work to push and pull a woven textile into being, Taeuber’s so-called elementary forms are not the pure elements of mathematic geometry, but rather seem alive, stretching or melting into their allotted containers, like amoebae on a specimen slide. 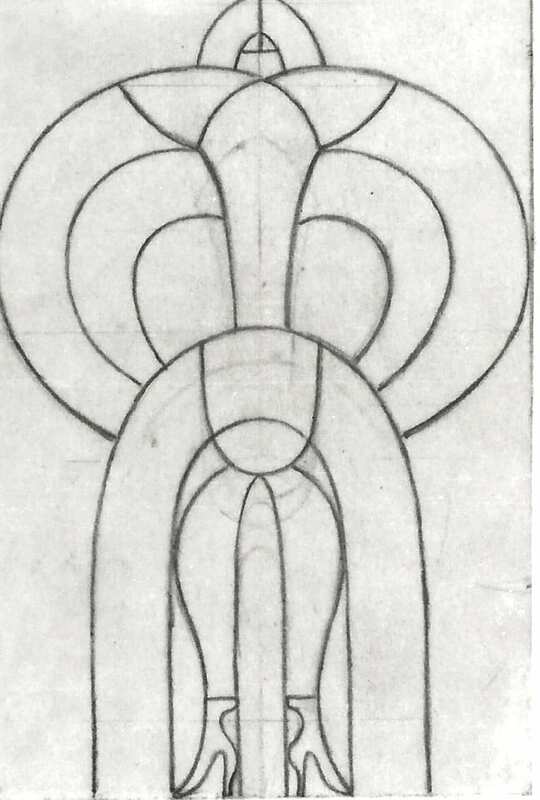 As the artist reworked her initial sketch for Elementary Forms to a more heavily painted and signed version, we can see the adaptations at work to keep the living expansion and contraction of formal bodies at play while the artist prepares her forms for the less malleable grid of a woven textile. In the work’s earlier iteration in thin, watery gouache and erasable pencil, forms emerge transparently in sections between the uneven foreground color and the paper’s bare surface. In an example that is particularly communicative of Taeuber’s will to thwart the grid and to move, the bottom right of the design holds a pink sail-like shape whose lower left corner is made from a meeting of two curves. These curved arms wrap around a crescent space in a surprisingly expressive gesture; it is a simple overlap that gives the sensation of touch, of muscular projection toward a goal. In a second version, Taeuber adapts to more thickly applied paint whose solid colors meet evenly on the clear grid schema. As she adapts her forms to the flatter medium that better imagines its future life in tapestry, however, Taeuber retains the sensations of muscular tension we read in her transparent gouache. Despite the shift to opaqueness in her second version, the sail’s formal overlap of arms remains visible. In either medium, is impossible to see her elementary forms as static; wherever colors abut, they test the relation of figure and ground by waffling against one another and resisting adherence to the grid formation. This elastic tension is retained all the way to the work’s edges where the work’s shape as a whole is not squared; the internal dynamics pull the frame off-balance toward the upper right. It is as if Taeuber predicts here the bodily tension involved in the future weaving, the human movements that work with and risk offsetting the perfect symmetry of a loom’s grid. Other examples of works adapted from sketch to painting to textile show a similar effort to retain the kinesthetic impulse of motion. A motif from the late 1910s or early 1920s, titled Danseuse, is of a hefty figure in a static, feet-apart stance.39 Paradoxically, it is not the dancer who is made to dance, but the medium itself. In her initial sketch for this motif, which appears in both paintings and rugs later on, we get a glimpse of Taeuber’s keen attention to proportion and to its subsequent obliteration. The dancer-figure began on a grid: a central vertical line is crossed by horizontals at the head, shoulder, underarms, waist, hips, and ankles. The artist’s erasures, however, reveal her attempts to add tension to and push the limits of the imposed grid. The height of the figure’s chest was moved multiple times from its original position, until the final mark is one of an inflated, expectant intake of breath. The movement upward hides the figure’s previously visible neck, so that the head seems swallowed up by the gesture. Taeuber also fretted over the figure’s pelvis, and raised this section a number of times. In both cases, the effect takes a dancer in a static stance, pinned to a grid of bodily proportions, and creates a less-recognizable figure that is nonetheless inflating before us in a tension of oversized arcs set to soar away. 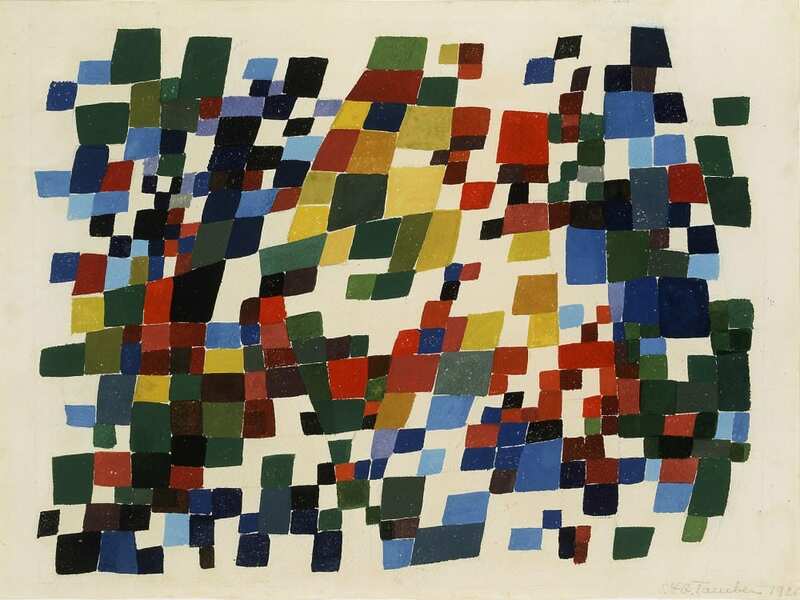 Taeuber’s paintings also reference an interest in dance and movement more obliquely, such as in Free Vertical-Horizontal Rhythms, 1919, or Composition in Dense, Polychrome, Quadrangular Spots, 1921. Here again we are faced not with discrete bodies seen in action, but with images of abstract grids that have been brought to life. As Walburga Krupp has put it, “The rhythm loosens, balance takes the place of symmetry, and a dancing lightness comes into play.”40 It is the component forms within the grid that stretch and break the vertical-horizontal axes of their paper support; these are not representations of movements in nature, but abstractions that have been freed in space to invoke the release of muscular intention and the sensation of motion itself. Even in the purely geometric vertical-horizontal compositions of the late 1910s, the asymmetry of Taeuber’s compositions allows squares and rectangles to step forward or recede, with tension mimicking the body’s vertical efforts against the horizontal pull of gravity. Much more could be gleaned in a larger study, too, through a discussion of Taeuber’s work with marionettes beginning in 1918, on the heels of her Dada dance. These sculptural abstractions of bodies are not an image of movement, but a moving art.41 In each of Taeuber’s mediums, she invokes a “pathetic symmetry” that brings plastic geometric abstraction to life.42Her forms meet in a partnered dance of perception, creating hybrids of vertical-horizontal, figure-ground, form-dissolution, part-whole. Much of Dada activity challenges art-historical traditions that emphasize objects over activity, single geniuses over collectives, and intention over reception. Dada poetry and drama leave behind a written form that may be studied; with Taeuber’s dance, the work of art was a durational, live act whose intentionality and presence cannot be retrieved.43 Performance’s failure to achieve presence, however, expresses the deeply solipsistic impulse that Dickerman has identified as a key aspect of Dada.44 As a wartime sense of lost community led to a retreat into the self, Dada writings repeatedly reference paralysis and sickness, invoking the body as the site of that self-awareness and loss. Ball reminds the Dadaist that aesthetic theories are only useful when applied to the individual, “We are dealing with men, not with art.”45 Naturally, when seeking intention and meaning in Dada production we are often deflected by this kind of internalism. But a Dada dance would merge the solipsistic self with its material representation; it is a body being in the world. Through the publicness of performance Dada might rebuild a hybrid community of relational individuals. The adaptive, collaborative, unsigned, and private aspects of Taeuber’s work allow her ordered visual abstractions to slide off the modernist grid into the living movements of objects in the world. When Taeuber shifts from the plastic realm to her live body, she bridges the self and the instruments of art.46 Through live performance, the purported autonomy of plastic art can be recognized as part of the contextual and relational present of both performer and spectator.47 Taeuber’s is not a body performing art but a body as art. Unlike Ball’s or Tzara’s performances involving the declamation of autonomous written works, dance more seamlessly hybridizes diverse systems in a single body. Dance carries both the universalizing ideas of aesthetics and the real-time experience of an individual self. When Demos uses Bakhtin’s heteroglossia to unpack the performativity of language in Tzara’s multivoiced sound poem “L’Amiral cherche une maison à louer,” he finds a political action to “introduce difference into purist conceptions of language.”51 A hybrid is a combination, but not necessarily a synthesis; it continues to express the multiplicity of its heterogeneous particulars. This kind of multiplicity is necessary for Ball’s Dadaist, who “no longer believes in the comprehension of things from one point of view.”52 Taeuber links a collaged language of high art to her singular body, rendering it no longer natural or whole, but responsible and relative. If expression through art and self-presentation can here be likened to social languages, then Taeuber’s dance goes beyond the Dada cacophony of heteroglossia. She can be seen to perform Bahktin’s hybrid utterance, “a mixture of two social languages within the limits of a single utterance, an encounter, within the arena of an utterance.”53 Taeuber’s utterance expresses the competing languages of art and life through a single author, thereby erasing finality and consensus while retaining the author’s position as an intentioned subject. Key to Bahktin’s heteroglossia is in fact that it cannot conclusively reach a final form, and herein we glimpse its anti-essentialist position for the modern artist: this is a hybridism that, as in the case of Taeuber’s body-art medium, defies the purity of a modernist trajectory. The photograph gives us enough information to see a Dada collage worn by a dancing body. Further exfoliation reveals that it is Sophie Taeuber, whose Laban training and work in design help us to read much more in this Dada dance. If the photograph is no longer seen as a transparent document but as an intentioned work of art, not only can we claim significance in each of the photo’s details, but we can imaginatively set the static body in motion and in fact gain a better view of Dada performance without falsely claiming to re-create its liveness and presence. The image is among the many transmutations Taeuber enacted in her art, in which abstract symbolic form is put into dialogue with life. Taeuber’s adaptation to dance produces a hybrid of visceral abstraction: somewhere between the high-art aesthetics of modernism and the chaotic anti-art actions of Dada. Through the information in the photograph and the performance it references, Taeuber gives Dada’s static art its most physical presence and realness, while also performing its drive toward disintegration and death. Drama historians have long understood that the theater “stinks of mortality.”57 Taeuber’s danced art rehearses its own death—as all time-based art is in effect an act of disappearance—but rather than identifying this with Dada mysticism or the mimicry of dehumanization in the face of industrialism, consumerism, and war, Taeuber regains the authenticity of the body. By hybridizing her body with her art, Taeuber hits upon the absurd and challenges the height of rationalized violence in 1916 with irrational sensation and visceral experience. She reminds us of the war’s wounded, of the stakes of Dada’s project for humanity, of Ball’s Dadaist who “fights against the agony and the death throes of this age.”58 Through representation, artists might hold wartime’s seeping chaos in stable abstract form, but by dancing her forms in performance, Taeuber would resist their transcendent or monumental aspects, and instead become a human ruin—hauntingly mortal, but also irrefutably live. I am grateful to the participants of the “What Was Modernism” seminar at Emory University in February 2012 who read an early version of this essay; their comments and the discussions of that day were greatly rewarding. Pieces of this research were presented at conferences of the Society for Dance History Scholars, the University of Georgia, the College Art Association, and the Modernist Studies Association; these venues also helped mold the ideas into their current form, including thoughtful input from Isabelle Loring Wallace and Juliet Bellow. Archival research was funded in part by a fellowship from the Willson Center for the Humanities and Arts at the University of Georgia in spring 2012. At the Stiftung Hans Arp und Sophie Taeuber-Arp, Rolandswerth, I received truly expert guidance from Walburga Krupp; and at the Fondation Arp, Clamart, I greatly thank Sebastien Tardy. Finally, deep gratitude goes to Hannah Feldman for her gifted critique and to the careful and perceptive reviews of the text’s anonymous readers. Nell Andrew is assistant professor of modern art at the University of Georgia, Athens. She is currently completing a book on the intersection of avant-garde dance and the development of abstract painting in late-nineteenth- and early-twentieth-century Europe, including studies of the dancemakers Loie Fuller, Valentine de Saint-Point, Mary Wigman, Sophie Taeuber, and Akarova. This essay originally appeared in the Spring 2014 issue of Art Journal.